● Shift to P and depress the brake pedal when starting the engine. Turn off or start the engine. 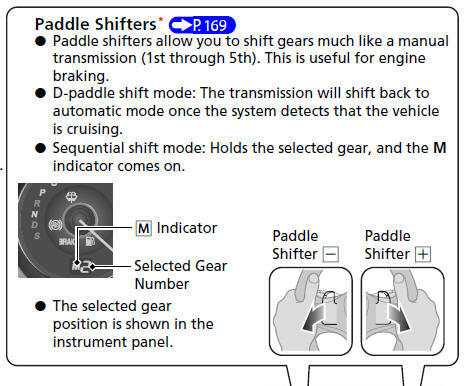 On models with paddle shifter, D-paddle shift mode can be used. Sequential shift mode can be used. ● The vehicle stability assist (VSA®) system helps stabilize the vehicle during cornering, and helps maintain traction while accelerating on loose or slippery road surfaces. ● VSA® comes on automatically every time you start the engine. ● To turn VSA® on or off, press and hold the button until you hear a beep. ● Cruise control allows you to maintain a set speed without keeping your foot on the accelerator pedal. ● To use cruise control, press the CRUISE button, then press DECEL/SET once you have achieved the desired speed (above 25 mph or 40 km/h). ● TPMS monitors tire pressure. 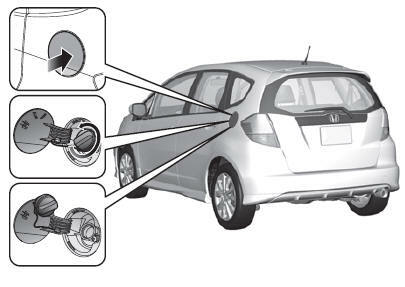 ● TPMS is turned on automatically every time you start the engine. 1 Press on the edge of the fuel fill door to make it pop up slightly. 2 Turn the fuel fill cap slowly to remove the cap. 3 Place the cap in the holder on the fuel fill door. 4 After refueling, screw the cap back on until it clicks at least once.